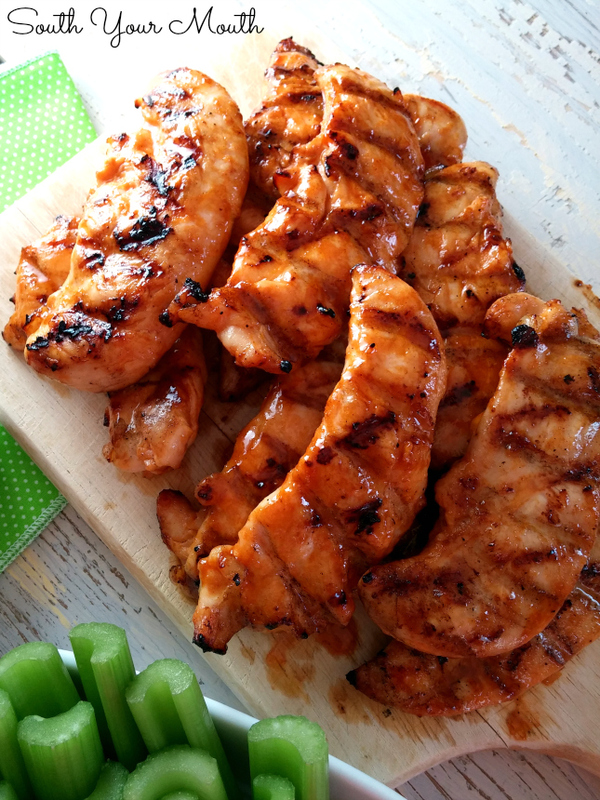 Grilled chicken tenders sauced like wings (similar to Wild Wing Cafe's) for all the fun and flavor of buffalo wings with half the work! So we bought a new grill. Finally. And because I've been without one for so long (and because I know in a month or two it will be too hot to even LOOK at a grill) I've been grilling like a mad woman! Seriously. It’s almost ridiculous. Deciding which vegetables to buy at the market comes down to one very simple question: can I grill it? The menu for the entire week will revolve around the grill. I've been keeping chicken tenderloins on-hand to throw on there too because they’re quick and easy for the kids. If I’m grilling something for Husband and myself that I don’t think the onions will necessarily love (or appreciate), I’ll just throw some tenderloins on there for them and everybody’s happy! Because um… I don’t know about y’all but buying an 8-year old a 2-inch thick ribeye ain't really how I roll. So anyway, I found a big family pack of tenders on sale and grabbed them up! Then I was wondering what in the world to do with that many because I’d never really thought of grilling chicken tenderloins by themselves. Like, just tenders with nothing else. And then I remembered the “buffalo feathers” at Wild Wing Café. They cook chicken tenders then sauce them like chicken wings and instead of calling them buffalo wings, they call them buffalo feathers. Ya know, because they’re kinda shaped like feathers? Yes, I know buffalo don’t have feathers. You know what else they don’t have? Wings. My usual wing sauce is basically equal parts hot sauce, soy sauce and brown sugar but I wanted to make these a little more like “buffalo wings”. Typical buffalo wing sauce is mostly melted butter and hot sauce. I sort of combined these two concepts and came up with the recipe below. And I LOVED IT!! There’s just enough brown sugar in there to balance the acidic pepper sauce without being cloyingly sweet and the soy sauce gives it another layer of flavor. I think I might have found my new favorite wing sauce recipe! FOR REAL! So good! I wouldn't consider these very spicy. My kids ate them without batting an eye. If I had to rate the heat, I’d say these were a 6 out of 10 on the spiciness scale. I served these with the typical accoutrement of celery and bleu cheese dressing but also served cool, crisp simple wedge salads with bleu cheese dressing and it was just so perfectly perfect with the chicken! I can’t wait to make this meal again! 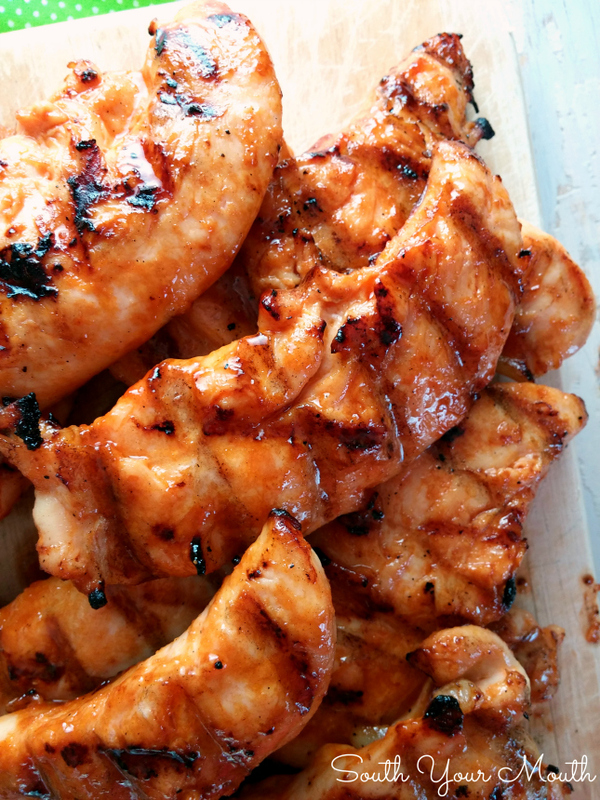 Combine hot sauce, butter, brown sugar, soy sauce and garlic in a small bowl and mix well to make the marinade and basting sauce. Combine 1/3 cup sauce, salt and chicken tenderloins in a bowl then mix well. I got in there with my hands to make sure all the chicken was evenly coated. Cover and refrigerate for 2-4 hours. Set remaining sauce aside, at room temperature, to baste the chicken with later. Grill chicken over medium-high heat, uncovered, until cooked through (it doesn't take long - don't overcook them! ), basting 2-3 times on each side with remaining sauce. For saucier “feathers” toss with remaining sauce before serving. Serve with celery and bleu cheese dressing if desired. The melted butter will solidify a little when it hits the cold chicken and more so when it gets refrigerated while it's marinating. That is A-OK.
You can also pan-fry these in a little vegetable oil then toss them in the sauce to serve. There are just too many variables when grilling to tell you how long to cook yours. I can tell you I cooked mine about 8 minutes on each side (on an open grill). The most important thing is to NOT overcook them. Because they’re somewhat opaque, it’s easy to tell how they’re cooking. I think it would be awesome to make a boat load of these and baste/serve them with various wing sauces like barbeque and teriyaki! I always always ALWAYS use Texas Pete Hot Sauce but if you can't get it where you live, try Cholula or Frank's RedHot. Use hot sauce. Not hot wing sauce or buffalo wing sauce or tabasco sauce. Just plain hot sauce. Hey Mandy! First time browser of your fabulous site (I've already forwarded it to my sister) and was so taken with your recipes and sense of humor I thought to myself "Hey, where's she from and all that....?" so I Googled you. Have you Googled your name lately? You should..... I 'bout laughed my girl-parts right off! Anywho, thanks for the recipes and giggles; I will forever be a regular stalker of your site! Haha! Welcome to the party! Hi Mandy, how would you do these with a lemon pepper sauce? I love the Wild Wing lemon pepper feathers. I think you could do it the exact same way!